One bite and you'll understand how the bar got its name. OhYeah! It's that good! Excellent source of protein whole nuts & dried fruit. 14g protein. 170 calories. 45g bar size. At OhYeah! Nutrition, we've built our reputation on delivering superior nutrition with unparalleled taste to communities worldwide. 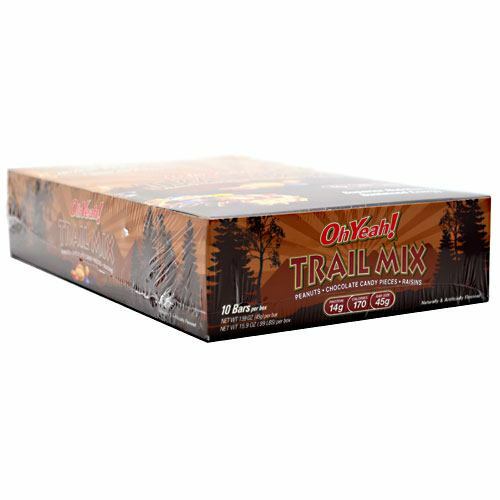 When our customers said they wanted a product that combined the classic convenience of a trail mix bar with the hunger crushing macronutrient balance of an OhYeah! Bar, we listened. Our first move was to consult the experts. That's right, we literally called our moms. We learned that there are three essential components of any great trail mix: whole peanuts, naturally sweet raisins and chocolate candy pieces. These trail mix staples provide energy, hunger satisfaction and important nutrients to keep you performing at your best when on-the-go. In the pursuit of making good things better, we added our award winning OhYeah! Performance protein to the classic trail mix recipe, creating the ultimate high-protein, all-purpose nutrition bar that strikes the perfect balance between meeting serious nutritional needs and indulging nostalgic snack cravings. In true OhYeah! fashion, it smarter snacking made simple, and it's still that good! Gluten Free. You're reviewing: ISS Oh Yeah!